As a man who was raised in the Catholic church, Phil loves the Catholic people. The issues raised are not against the Catholic people, but with Roman Catholicism doctrine and dogma. In love, Phil examines the positions of the Roman Catholic Doctrine of Salvation, the claim that the Pope is infallible on matters of faith and morals, the doctrine that a Catholic priest is the only person who has the authority to forgive sin, the existence (or non-existence) of Purgatory, the idea that Mary is the Co-Redemtrix along with Jesus, where Rome gets the authority to pronounce you “anathema” (damn your soul to hell) if you disagree with its more than 100 cannons and decrees (which read like complicated and often contradictory legal documents), the doctrine found in the Official Catechism of the Catholic church that says Catholics worship the same God the Muslims do, the doctrine of Transubstatiation, (the idea that the bread and wine literally become the body and blood of Jesus) and much more. Find out how much more in this absolutely fascinating 4 part series on 2 CDs. 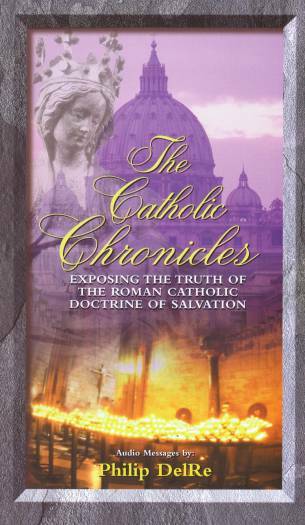 Be the first to review “The Catholic Chronicles--Exposing the Truth of the Catholic Doctrine of Salvation 2 CD set” Click here to cancel reply.